Warning: Spoilers for the first section of Assassin's Creed III. While the reviews for Assassin's Creed III three are generally positive, there are plenty of acute critiques of the game - most of which I agree with. Some earlier features have been abandoned and some of the side missions in the latest title feel forced and poorly put together. Perhaps most consistently frustrating player is the game's first few hours. See, the game stars Connor, a half-indigenous native of Massachusetts with a grudge against the Templar. We all knew this going into Assassin's Creed III. The bow-and-arrow touting assassin is still plastered over bus stops all across San Francisco. Yet when players first start the game, they are treated to a British aristocrat with a chiseled face and years of experience. The game breaks expectations. Where is the white robed, tree-climbing assassin we were promised? 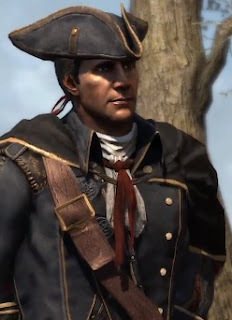 After a few moments, most players likely assume Haytham, the temporary protagonist, is in fact Connor's father, and rightly so. Like a good deal of others, I figured this was their way of introducing us to the world. Newly excited, I'm interested to learn about Connor's assassin father. And then the game chugs on unbearably slow. Haytham spends time running back and forth on a boat, really getting across the tedium of seamanship. When the crew finally spots land and the title card appears, for a moment it seems like it was all worth. Eighteenth century Boston! Freedom at last! Then the reigns are pulled in again and the game shuttles Hatham along to various missions and force players to accomplish their goals in a terribly constrained environment. All the while, Haytham takes an unbearably long time finding and courting Connor's mother. Finally, after an insufferably long introduction, Connor's parents conceive of the game's actual protagonist, whose existence I questioned by this point. Suddenly, a plot twist. Haytham is not an Assassin at all, but a Templar. Connor will have to kill his own father! It all made sense. I understood why Ubisoft spent so much time with Haytham. He shares his first vision of Boston with players. His traversal of buildings, the feel of which we all know so well, is our first climbing experience in the game as well. We naturally fall right into playing Assassin's Creed III, and so we comfortably associate ourselves with Haytham. His Templar status was a genuine surprise, and a neat one at that. The problem with the games introduction, or more aptly its prologue, has nothing to do with length. I would have been perfectly happy playing a young Connor for more hours than the game offers. The problem is its quality. Assassin's Creed III insists on holding your hand for the first four hours, a travesty considering how well known the series has become. It creates this false feeling of constraint that serves no real purpose, other than to usher Haytham along a narrow path towards the game's twist. By the time the introduction feels firmly over, well into Connor's history, the pacing is so off that what could have been an interesting story comes off as poorly constructed attempt to shock players. This late in the franchise, such tricks are best left off the table.